The Landmarks Commission will hold a hearing on a request to replace the garage at 828 Calapooia St. S.W. with a bigger one and an apartment on the second floor. The Albany City Council’s deadlock on a code change for detached accessory dwelling units has not prevented ADUs from being built or proposed, and neither has the current limit on their size. Five ADUs have been approved on residential lots in Albany in the last few months, none bigger than 750 square feet, according to online information accessible via the BuildingEye portal on the website of the community development department. Now there’s an application pending for a 633-foot apartment beside the house at 828 Calapooia St. S.W., the former home of the late Lew Hurd, a longtime Albany physician who died in 2010. The house dates from 1927. It lies within the Monteith Historic District, and the Landmarks Advisory Commission has scheduled a historic review hearing for 6 p.m. Wednesday, Feb. 6. The property owner submitted plans to replace a small garage in back with one having a bigger footprint and a second floor. The addition would be accessible from the house via a reconstructed “widow’s walk” on top of an attached carport. So whether the living unit would count as “detached” is not clear (at least to me). But it no longer matters. While the city code still prohibits detached accessory living units on some lots, the planning department has been allowing them because state law demands that cities permit them on all single-family lots subject to setbacks and other rules. A majority of the council and the mayor have been unable to agree on a code change to carry out the state mandate. The mayor wants to stick with the current size limit for ADUs of 750 square feet, plus current rules on additional off-street parking and owner occupancy of the main or accessory unit. Council members want up to 900 square feet and no rules on parking or ownership. On Jan. 9 the council agreed to continue a public hearing on ADUs on Jan. 23. 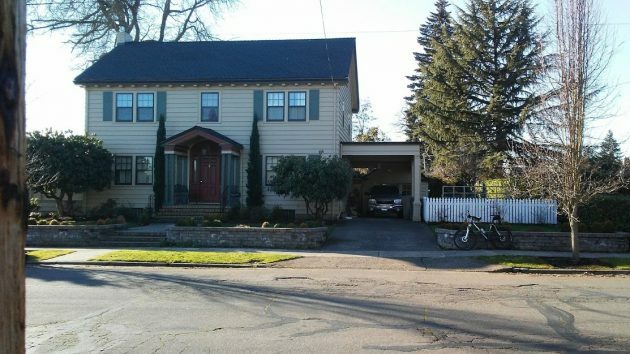 The current size limit, though, apparently was no problem for the ADUs approved since last fall. On Sept. 25, the city issued a building permit for a 750-foot ADU at 906 Broadway St. S.W. On Oct. 5, it approved a permit for a 750-foot, two-bedroom ADU at 915 Jones Ave. N.W. A new ADU of 360 square feet, in a converted garage and addition at 1675 Main St. S.E., was approved on Nov. 26. On Dec. 17, the building division OK’d construction of a detached garage with a 532-foot apartment on the second floor at 705 Fifth St. S.E., where Bob Mitchell is building a new house in the Hackleman Historic District. When the project went through historic review earlier in the year, before it had a change of heart, the city told him the apartment could not be allowed until the code was changed. And on Jan. 2, a permit was approved for a 685-foot ADU at 2883 South Shore S.E. Considering that all these dwelling units, including at least one with two bedrooms, fit within the current size limit, the council majority may want to explain exactly why it wants to increase it. None of these units, by the way, come cheap. On the building permits, their estimated value ranged from about $42,000 to $125,000, with city fees of about $8,000 or $9,000, including systems development charges for streets, sewers and parks. Why not?! Tell me how an additional 150sf will materially affect the neighborhood to its detriment? NO one has been able to point me to a specific example of *any ADU* built in Oregon in recent time that has damaged the “livability” of a neighborhood. That includes those bad people in Portland too.